Chinese and foreign scholars and industry experts teach on the program, and Chinese and foreign students learn together in a single class. Graduates of the project work in a range of careers. Many enter domestic and foreign mainstream media such as CCTV, China Radio International, Xinhua News Agency, China Daily, PBS, AP, BBC and The Wall Street Journal. Graduates also work as freelancers in journalism and documentary. Some graduates may work in multimedia storytelling for non-profit / charity sectors, for example, UNICEF or Greenpeace. Other students enter fields of corporate communications or education. Sharron Lovell – Course Leader, Practical Module Leader – Sharron Lovell is a visual journalist and storyteller. Her work has been published in National Geographic books, Newsweek, The Guardian, Global Post, PBS NewsHour, ChinaFile, Politiken, The Wall Street Journal, The Economist, The Irish Times, Forbes, The Independent, Le Monde and The Financial Times. She also works as a regular multimedia storyteller and consultant for UNICEF and non-profits. Sharron holds a BA (First Class Honours) degree in Photography and an MA Degree in Photojournalism & Documentary Photography. Sharron has led photographic workshops and training for photographers and journalists in China, Pakistan, Afghanistan and Sierra Leone, Bangkok, and Malaysia.The course has three permanent lecturers, all of whom are also practicing multimedia journalists or storytellers. Between them, they deliver the core training for all the practical skills and conceptual analysis in the course. Working alongside them are a number of highly regarded international journalists who are adjunct lecturers teaching specialized skills and discussing project ideas and editing decisions with the students. Sean Gallagher – Senior Lecturer – Sean Gallagher is a British photographer and filmmaker who has been based in Asia for nearly a decade. His work focuses on highlighting environmental issues and crises, with a specific emphasis on developing nations in Asia including China, India, and Indonesia. Graduating in zoology from in the UK, his background in science has led to his desire to communicate important global environmental issues through visual storytelling. He is a six-time recipient of Pulitzer Center on Crisis Reporting travel grants and his work has received distinctions from the Earth Journalism Awards, Press Photographer’s Year Awards and Atkins CIWEM Environmental Photographer of the Year Competition. His work has been published internationally, appearing in Newsweek Magazine, TIME, CNN, The New York Times, National Geographic News, The Atlantic and BBC News. He is represented by National Geographic Creative. Yan Cong – Theory Module Leader – Yan Cong is an independent photographer based in her hometown Beijing. She focuses most of her long-term projects on women’s issues, urbanization, and China’s relations with its neighbors. Yan has received grants for her long-term projects from Oslo University College, the Abigail Cohen Fellowship in Documentary Photography co-founded by ChinaFile and Magnum Foundation, and Guyu, a foundation founded by Tencent to support non-fiction work. She was nominated for the Joop Swart Masterclass in 2016 and 2017. Her work has been published and exhibited internationally. Yan is the co-founder of a Chinese-language photo blog, Yuanjin. She also writes a monthly column about the best photojournalism work from China. Yan holds an M.S. in journalism from Columbia Journalism School. Course Founder – Dr. D J Clark – Senior Lecturer – DJ Clark is a short form multimedia journalist. He specializes in telling news stories on digital platforms using his high-level skills in text, video, photographs, audio, infographics and social media. He has worked with media organizations across the world as a journalist, trainer and multimedia consultant. He is currently a multimedia strategist for CCTV and a regular video contributor to The Economist. D J Clark researches and writes about multimedia journalism as a vehicle for social change, the subject that drives both his journalistic and academic work. He is part of the core training team of World Press Photo and runs multimedia journalism workshops throughout the world. In 2008 he gave a speech at the World Press Photo Awards on the growth of Majority World Photojournalism, based on a Ph.D. he completed in 2009 at the University of Durham that focused on photojournalism as a tool for social change in the developing world. Starting his career in 1988, D J Clark worked first as a photojournalist before moving into video journalism and later to multimedia journalism. Over the last 25 years, he has covered stories all over the world for leading newspapers, magazines, news agencies and TV stations. In 2006 he moved to China where he is now based. 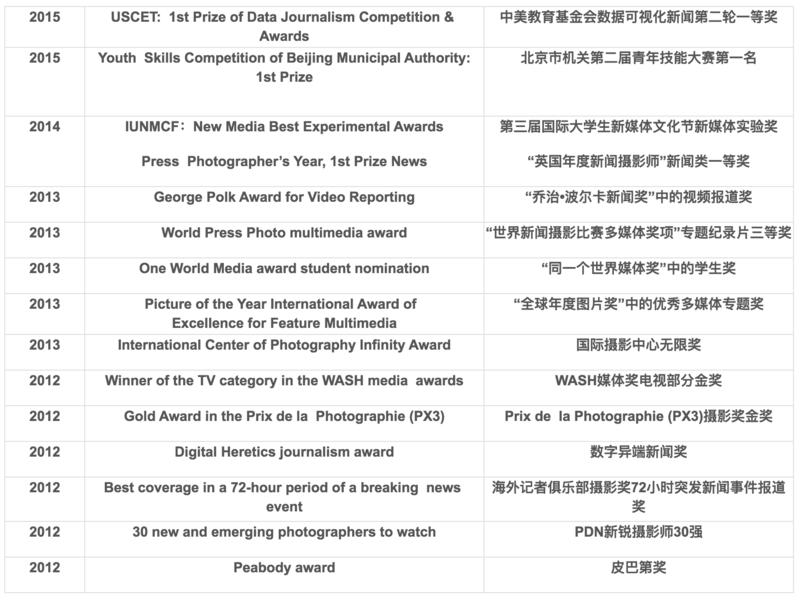 In addition to core staff, the IMMJMA has a number of regular visiting guest lecturers and workshop leaders working for organizations including Xinhua, CTGN, New York Times, AFP, China Daily, South China Morning Post. 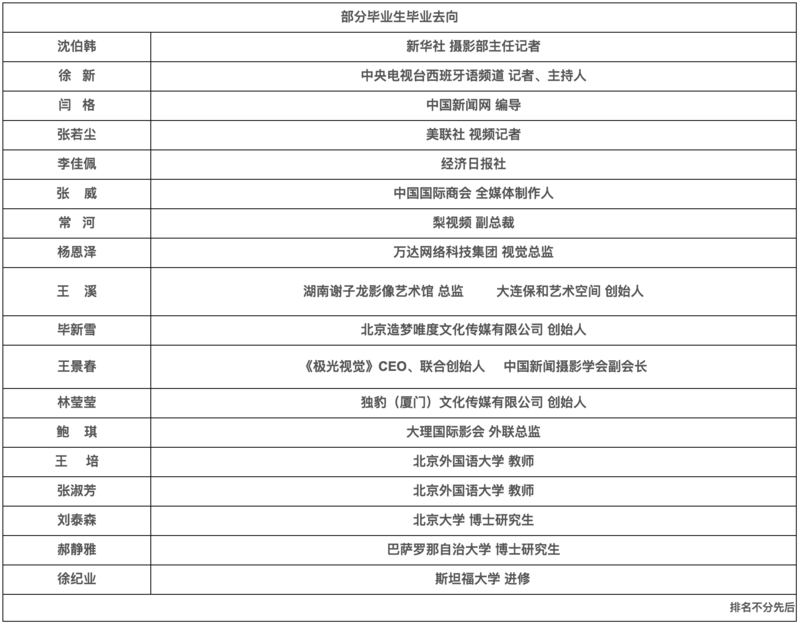 Programme costs – Tuition: 90000 yuan / school year; accommodation fee: 3800 yuan / school year registration fee and examination fee: 500 yuan / person. Other Costs – All students must have either a video-enabled DSLR camera or separate (prosumer or above) video and stills camera, a sound recorder, a range of lenses between 28mm and 200mm (35mm equivalent), a good tripod and a few other small accessories. You will also need a laptop computer capable of video editing, software and hard disk storage capacity for working with multimedia projects. Please contact the course leader for a detailed gear guide. You should have one of the following, or their international equivalents: a bachelors degree in a relevant subject; or a degree and significant professional experience in the media industry; or a degree and a relevant major multimedia journalism or storytelling project. Your application will be considered if you do not have any of the above qualifications but you do have significant experience in the field of journalism or communications and you are able to present a strong portfolio as part of your application. IELTS score of 6 or above (minimum of 6) or TOEFL score of 85 (minimum of 20), certificate of English Level 8 or Certificate 6 in English, major Not limited to. Applicants are required to provide the following application materials: a copy of a valid ID card, personal English statements, university transcripts, copies of academic qualifications and degree certificates, two Chinese or English letters of recommendation, news related works or certificates. You will be required to email or present an online portfolio of media work (one or a mix of photography, video, text articles, graphic design, audio, etc.) and examples of academic written work. Your portfolio will be discussed/assessed at interview, demonstrating your suitability and aptitude for the course. An admission Committee composed of Chinese and foreign experts reviews and evaluates individual application materials and determines candidates for interview; interviews test English proficiency and understating of the journalism industry as well as a clear commitment to study. You will be taught by a range of staff with relevant expertise and appropriate knowledge to the module content. This will include senior academic staff and you will also benefit from regular guest lectures from qualified professional practitioners. In the first term, through workshops, seminars and short assignments students develop core multimedia skills needed to deliver short-form journalism stories on digital platforms. We teach technical proficiency without losing sight of fundamental news literacy and newsgathering skills. Writing, photography, audio, video, infographics and social media, as well as a critical understanding of contemporary trends in the new media economy, are all covered. At the end of the term, students complete a practical assignment to deliver a news story within 24 hours, using multiple media formats and social media on a digital platform. In the second term, students undertake two long-form multimedia journalism feature stories or projects that require both an in-depth understanding of new technologies and a willingness to apply them in the context of online journalism. Projects are underpinned by relevant contextual reporting research. Half of the term is given to researching and developing the project ideas, taking into account – methodology, audience engagement, and impact, ethics, risk assessment, as well as logistics before in-depth reporting. At the same time, students develop written proposals for the projects that can be used for professional pitches and grant applications. In the third term, guided by course staff, students individually develop one of their second term projects into a 15-week major assignment that is accompanied by a 5,000-word dissertation that critically reflects on the context, production, and distribution of their story. We place value on channeling students in the directions they choose. This facilitates them to fine tune skills and to produce a professional-grade journalism project or story that should serve as a portfolio to launch or elevate their chosen career path. 1) Firstly, it’s essential that you take a look at the www.immj-ma.org website to gain a good overview and understanding of the program. 4) Once the application has been received and approved you will be interviewed. Within two weeks of your application, you will be given a result of either, accept, fail or reapply. With reapply, you will be given the opportunity to resubmit an application later and suggestions on what you need to do to improve. Applications will be accepted until all places on the course are filled. Students will be interviewed via phone or Wechat. An electronic portfolio of your multimedia or visual journalism or storytelling work. We suggest applicants should send work via a website or other digital platforms. You may also use folders on Dropbox, please ensure that materials sent via folders are reduced for web sharing. 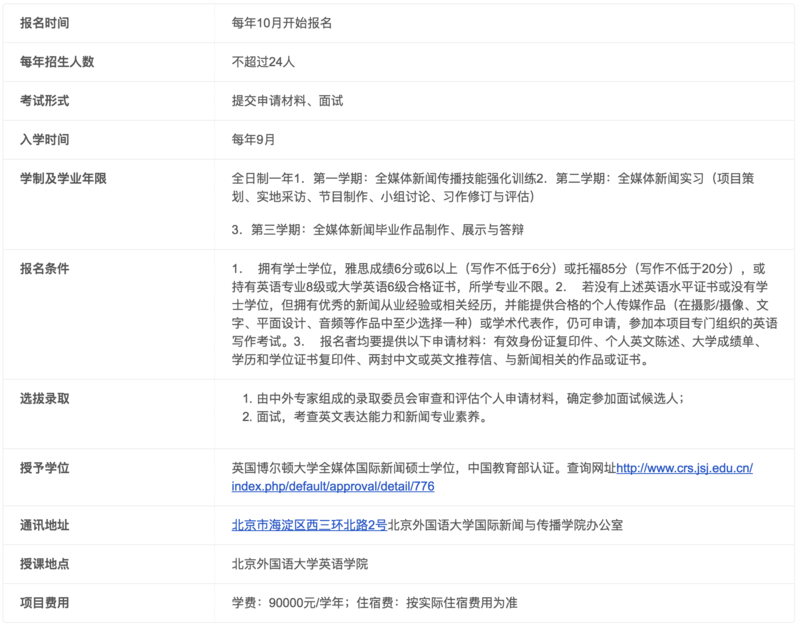 Folders that need to be downloaded via QQ etc will not be accepted. You may also share links to work on platforms like Youtube, Vimeo or Soundcloud. We are looking for you to demonstrate a clear style and commitment to the area of study. Please edit your submission folio down to what you regard to be a few pieces of your best work. Your portfolio and application materials should be well organized and selective. If the items are poorly organized you will be asked to resubmit and your interview will be delayed. During the interview, we are looking for you to demonstrate a clear understanding of the IMMJMA program and a commitment to the area of study and a keen interest in journalism. 6) Please note, the IMMJMA requires 40-hours of study per week from September to August. There are just 5 weeks of holiday during the year-long study period and no holidays may be taken outside of the scheduled holiday periods. Students are required to attend all scheduled class sessions. Typically 2 full days each week.